While I wish I could be sporting bare legs like I see other bloggers sporting, that's just not a reality here where temps continue to be regularly in the 40s. Nevertheless, I still want to be wearing something spring-like. Then, while browsing the SheIn website, it hit me. Florals and spring go together like peanut butter and jelly. This dress gives enough coverage for cooler spring temps while emulating spring with its pretty floral print. Long sleeved dresses are tough to find, especially in such pretty colors and styles. Of course I snatched it up immediately. It was obviously a popular item because it keeps popping out of stock and then back in stock. As of last night when I checked, it was back in stock in all the sizes (for reference I am wearing a medium). For under $30, it's such a great piece for spring! Otherwise check out all the fab SheIn maxi dresses here! Mine came in just over a week and I was able to pair it with my new lace up flats from DSW and Tory Burch tote a la the recent Shopbop sale. It's definitely going to be my go-to tote this spring and summer. I use my black tote so much I new a cognac one would be great option for me! That dress is stunning on you, love the print. 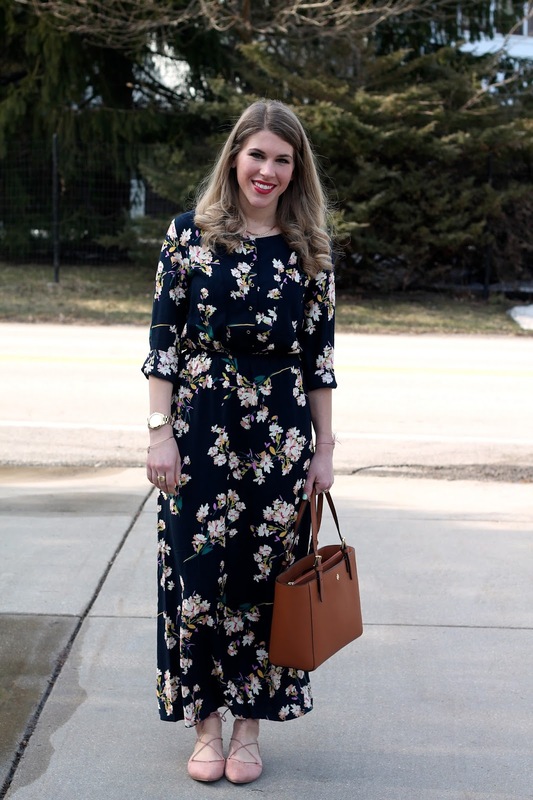 That maxi dress is gorgeous and perfect to transition to spring! I love the color of your flats! I would love to be able to pull off a dress like this...I love the cut and the floral hues! Beautiful! 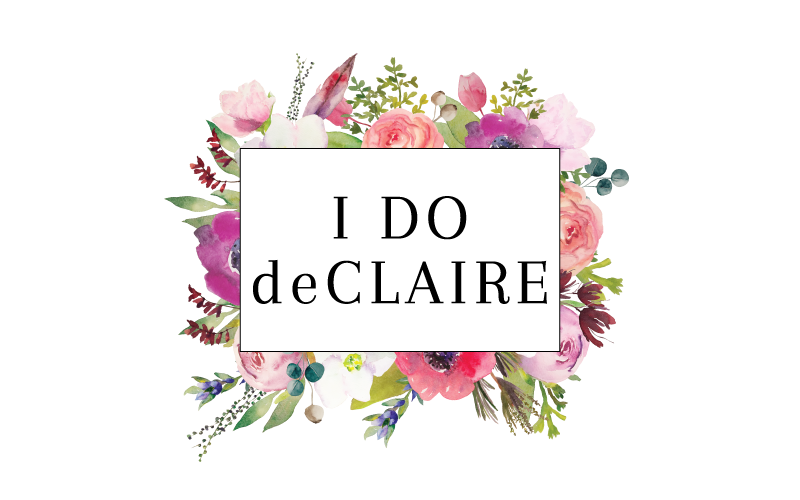 I've seen that dress and was contemplating on buying it, but then I realized I had way too much floral already. Seeing how good it looked on you, you're making me regret! This is such a pretty dress and the perfect transitional piece for spring! Gorgeous dress! Perfect for the beginning of Spring! Yay for floral maxis! Loving this one on you, lady! Ohh! I LOVE this dress! I'm doing the same thing right now. Trying to use florals and colors to make it feel a bit more like spring. So cute! Especially with those adorable flats. 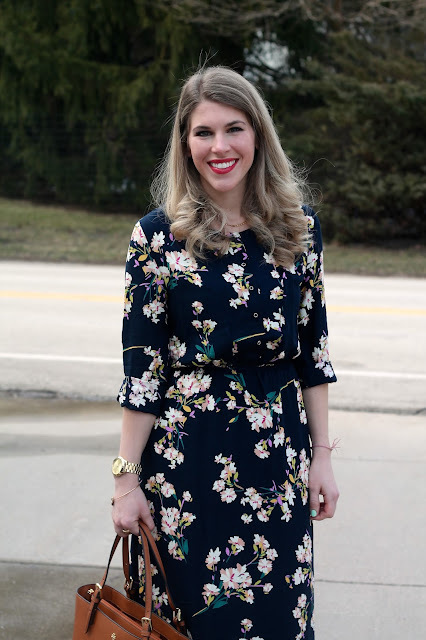 I wish I had a full length floral dress for cooler temps, this dress is just gorgeous on you! That is such a great print. It's perfect for the start of spring. What a lovely dress! It's such a whimsical piece. The lace up flats are a great touch too. Such a cute outfit, I'm loving lace up flats too! That dress looks so beautiful on you! I love the print and those lace up flats. Perfect Spring look! The tote is perfect and a great colour and the dress is so fun and also works great for fall and cool summer nights. What a gorgeous maxi dress Laura. 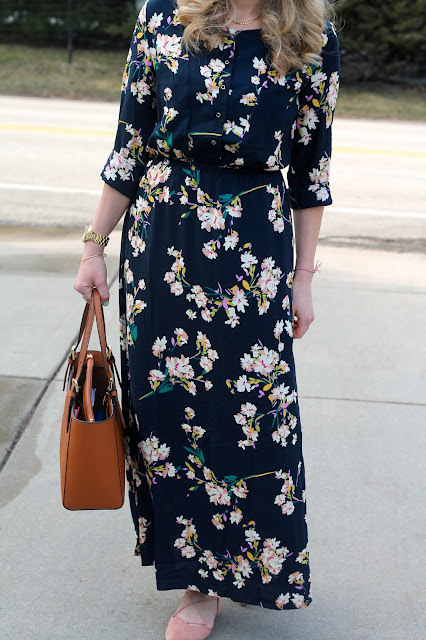 I would love to add a couple of floral maxi dresses with sleeves, this year. I also love those blush lace-up flats. This outfit is super chic head to toe. Love it! 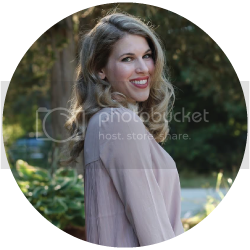 Please, I would love for you to join my new linkup with this pretty outfit and any other recent outfits. They are such pretty outfits and deserve to be shared. What a gorgeous dress! I love it with those blush lace-up flats especially... you really do look like spring! I've got to add some more maxi dresses to my wardrobe--it's sad just how few I have! love this dress on you. gorgeous floral with such femininity. great choice. That dress is so very pretty...and those flats...love them! Thanks for linking up to Top of the World Style. This dress looks great with the blush flats. A floral dress and blush flats certainly do say spring! I hope it starts to get a bit warmer for you soon! We were lucky and got a taste of it, but next week it's going to be back in the 40's for me too. Beautiful maxi dress and it looks so pretty with your lace up flats! I hope warmer temps are headed your way soon. Thanks for linking up and have a wonderful weekend, Laura. Cute dress, do you wear leggings under to keep you warm? I am a big wimp and could never go bare legs with temps in the 40s. That is a good idea! I am wearing a slip and long sleeve shirt to help! The day I wore this we had a surprisingly nice 50 degree day, too! It's a beautiful dress! Looks great on u and with the flats.